Being Okinawan Japanese descendant living in Argentina, I was always surrounded from an early age of Oriental images; the Asian culture was on every space in which I moved. One of these images was the Shisa (Lion Dog) small ceramics that adorned the ceilings, furniture and shelves at my grandparents house and other relatives as well. I spent time looking at those sculptures, his ferocity and grace, the brightness of their bodies, and at the same time the duality always shown in both, staring at them I create fantasies that only a teenager could do at that age. 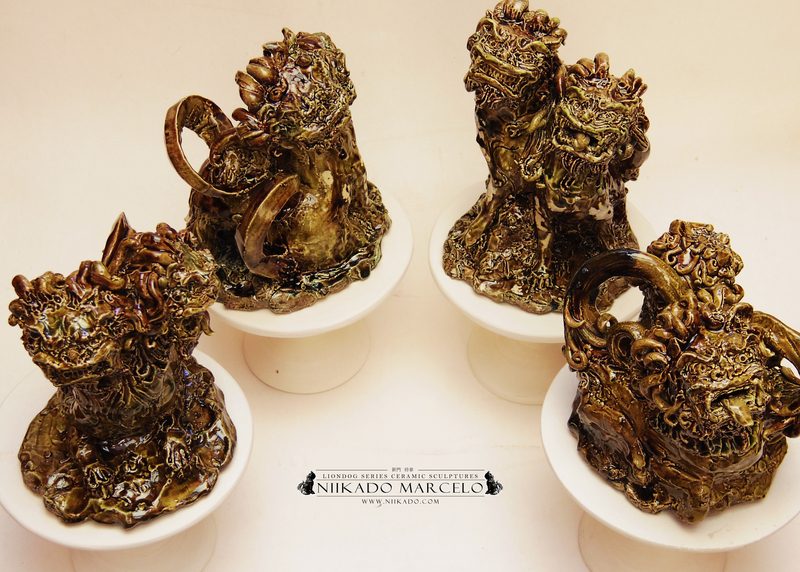 While studying Oriental style pottery in 2006, I began to make my first Lion dogs, since that moment, a long series of them in different poses, both Chinese and Okinawan influences within the variety of shisa were made. With the passage of time in 2013 I began to add more movement and dynamism influenced by Art Noveau (a style I was always attracted to), trying to achieve a balance combining both styles in the same sculptures. Still now I keep making efforts to create Shisa with my own originality. In 2014 I and the Japanese garden foundation organized and held the first exhibition of this kind of sculptures in Argentina showcasing 26 pairs of ceramic sculptures at the main salon of Japanese garden in Argentina, introducing for the first time to the Argentine public part of the tradition of Okinawa and Asia as well. Some of my works lay at Japanese and Argentina private. In 2015 Japanese garden Foundation acquired 2 pairs of Shisa sculptures to be placed into the next SHUREIMON (Okinawan style gate) built in honor of the Okinawan immigrants in Argentina. 2011 Mixturas “El arte y las colectividades” Centro Cultural Recoleta. 2013 Mixturas “El arte y las colectividades” Centro Cultural Recoleta. 2013 1er Encuentro Zen en Latinoamerica. 2015 Japanese Garden in Argentina.